Save Little Oz Park - Sign the Petition! The Metro Vancouver Parks has proposed a plan for a new service yard for Pacific Spirit Regional Park. Currently, the Little Australia Park is one of the three sites being considered for this new service yard. The proposed service yard will be about one acre in size (4000m2), and will be used for many purposes, including the storage of materials such as paint, gravel, trail materials, garbage, firefighting chemicals and fuel for equipment. While a new service yard for Pacific Spirit Regional Park is important to service and maintain the park, the residences living in the area and the UEL Community Advisory Council (CAC) are concerned about the social, health, environmental and economic impact the yard will have for the residents and the community. Our goal is to have 200 people e-mail the Metro Vancouver Parks Board by signing the petition here to oppose the choice of Little Australia Park as a candidate for the service yard. Please ask 5 of your friends and family members to do the same! Please click here for the contact information and a sample e-mail template you can copy and paste to email Metro Vancouver Parks Board. A Save Little Australia Park public information session will be held on Monday, November 28 at 7:00pm at the UEL Community Space - Suite #300 - 5755 Dalhousie Road, Vancouver (map here). The space is located above the Starbucks in the University Village at University Blvd and Allison Rd. Underground Parking is available from Allison Rd. What is a Service Yard? A regional park service yard typically has facilities and storage required to service and maintain the park (e.g. tools, mowers, forest-fire-fighting equipment, wheelbarrows, lumber, fencing materials, signage, gravel, garbage and recycling bins, vehicles, workshop facilities, restoration project facilitates). The existing park service yard is located on provincially owned University Endowment Land property adjacent to the University Endowment Land administration and operations buildings. The service yard consists of several repurposed trailers and outbuildings that were established in 1990. They are in poor condition and are inadequate for current park operational requirements. Hence, a new service yard is required to provide save and efficient work space for park staff and to ensure a continued high level of public service, secured equipment and supplies, natural resource protection, facility maintenance and etc. The proposed service yard will be used for facilitites and storage required to service and maintain the park. The service yard will be about an acre in size (4000 sq. m,). The three sites considered for this projects are: Little Australia, 29th & Imperial Drive, and Sedgewick Fill Site. 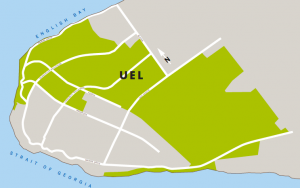 At the July 2016 UEL Community Advisory Council (CAC) public meeting, there was unanimous community support for the Little Australia Park to not become the new service yard site for Pacific Spirit Park. A Working Group was created to work to save the park and relocate the service yard to an alternate site. The group has reviewed Metro’s three proposed replacement service yard sites, and strongly rejects any site within the Little Australia Park triangle. Accessible and safe parks are an essential ingredient to a healthy neighborhood, providing a place to exercise, play, spend time with friend and neighbors, or just relax and recuperate Research shows that parks matter for health; the effects of nearby parks range from increasing physical activity to improving mental health. Parks provide people with contact with nature, known to confer certain health benefits and enhance well being. Active park users was have fewer related to visits to a physician other than for routine checkups. Physical activity has been identified as a ‘best buy’ for public health. Physical activity opportunities in parks help to increase fitness and reduce obesity. A significant and growing body of evidence links insufficient physical activity to a number of medical problems and premature death. Walking and cycling have been identified as a key means by which people can build physical activity into their lifestyles. The Little Australia Park sits at the headwaters of the Spanish Bank Creek that runs through a ravine to the ocean, and is in the center of the watershed that feeds the creek. The ravine is a sensitive fish habitat, rehabilitated in 2000, that supports salmon and trout as well as the invertebrates they feed on. Any contaminants from a service yard located in the Little Australia Park triangle area could have a serious negative impact on the entire aquatic ecosystem of Spanish Bank Creek. Increased pollution would also affect the many plant and animal species (such as otters and mink) found in this area. The proposed service yard site in Little Australia Park is north and west of residential neighbourhoods, and the resulting noise could severely impact residents. As an industrial site, its activities will create a considerable amount of noise from traffic to and from the yard and activities within the yard. The yard will be busy on week days, at night, and also on weekends for various Pacific Spirit Park work parties. If the service yard is located in the treed area north or west of the open park space, the trees that currently act as a noise control buffer for the traffic along 4th Ave/Chancellor diversion will be removed. This will increase the traffic noise from 2 to 4 times, depending on the location and orientation of the yard. The proposed service yard could create serious hazards for cyclists along Chancellor Blvd, part of a heavily used cycling route to UBC. These hazards could result in serious injury. Increased traffic to and from the yard could lead to increased vehicle/cyclist collisions in the area. Materials stored at the site could result in spillage of debris, such as gravel, on the roadway. This could cause a cyclist to lose control, resulting in a non-vehicle involved accident. Why is Little Australia Park important to you? "It is ridiculous to put a number of employees coming and going in their trucks everyday. The employees then take heavy equipment and heavy duty trucks off site only to return to the yard around the end of the school day when children are trying to get home. Does the city not have an industrial areas where the works yard would be more suitable. This is a quiet residential neighbor which also has to deal with the 30,000- 40,000 students going to UBC. City staff don't seem understand their community to even suggest this area." "We live east of Blanca and yet this little organic park has always been the park of choice when either planning some adventure play with our kids (or now grandkids) and giving our small dog a run. For us its assets have been (a) it's off the beaten track, (b) seems very safe, and (c) the lack of a formal playground and associated equipment encourages children to use their imagination when playing games. It combines the best of both worlds - open space and trees/bushes. Please do not destroy it." "Little Oz Community Park is a quiet, open green space that has served as a community park for decades, providing the neighbourhood with a safe, green play area for children, a walking and dog-walking destination for miles around, a safe gathering place for families and seniors. Sited at the convergence of quiet residential streets in both the City of Vancouver and the UBC Endowment Lands, bordered by flowering plums and cherries, it serves the community as a safe, open, green community play area and meeting place. To place a works yard in this quiet magical greenspace would be an invasive act of industrial rezoning, requiring 24 hour lighting, fencing, buildings, trucks, equipment, personnel, gravel, dirt, water, electricity, and sewer hookups, smells, noise, and without any appropriate road access. A travesty! How could anyone even think of such a thing?! Destroy neighbourhoods and communities? This is wrong on every level. And it is a ballot box issue!" "Because I feel strongly that parks make a community." "It would be a shame to lose our beautiful neighborhood park"
" A service yard seems a little out of place for this quiet neighborhood." "Little Oz Community Park is the only green space available in this corner of Pacific Spirit Regional Park." "This decision will destroy another little piece of our community's green spaces." "I am signing because this is an important place for neighbours to connect with one another." "This park is a very popular for many people walking their dogs. There is no other park in the community." "It seems ridiculous that a small, quiet neighbourhood park would be considered as a potential location for a Services Yard. It is, as others have commented, a well used green space at the heart of the local community. Government should be FULLY utilizing existing lands suitable for light industry, not destroying green space. Once it's gone, it's gone forever." "This little park is an integral part of the Little Australia neighbourhood. It is the only green space the neighbourhood has, and provides outdoor exercise, recreation, a play-park for children, and healthy outdoor enjoyment to the residents of Little Australia and countless others who live in the area. It is in the headwaters of a salmon stream. It is on a major bike route for students going to and from UBC. Why in heaven;s name consider such a pretty little green space in a quiet residential area to cover with an industrial complex? There is a large choice of other land around and in Pacific Spirit Regional Park where it could be far more rationally located. Don't pick Little Australia Park just because it is close to the current works yard. Employees are flexible, green space is not. Think outside the box. Green space is to be preserved, not permanently destroyed." "We need to preserve green space everywhere in Vancouver. We are going to become a city of high and low rises and we will need places to get out to. Try to find accessible neighbourhood parks in Toronto..."
"I'm signing this because I want to ensure that we keep as much of the Little Oz area filled with green space." "Little Oz Community Park is a wonderful little park, where are family has regularly walked our dog, played bocce, and picked blackberries. I just can't believe that this residential, quiet park is the best place for a works yard." "It's a wonderful, safe park for children and dogs. I go there with my dog and grandchildren and we feel safe there." "I do not think that the Little Australia Park is the place for a service yard." "Where is the logic in paving a much loved and used park in a family neighborhood for a works yard?! This beautiful park is enjoyed not only by the local residents, but also those in the broader community! DON'T PAVE THIS PARK!" "This little gem of a park is used by many people from in & around the neighbourhood. It is a community hub, a playground for kids & dogs, a bocce green, a boot camp, a starting point for a woods walk, a blackberry picking paradise, a practice ground for beginner tightrope walkers and a perfect picnic place. Owls, raccoons, ducks, coyotes & squirrels all make this park their home. This place provides so much to so many - its destruction is ridiculous, shortsighted and harmful." "I disagree strongly re this park being altered in any way! Leave the green space alone. Sign the petition." "I feel the park is a safe place for the neighbours to gather with there children and pets - it's priceless!" "There has to be a better place to locate this facility. What is wrong with its current location?" "I visit this area regularly 1 or 2 times a week and value the natural setting and beauty of nature." "It is ridiculous to put so many cars and employees with various trucks and equipment in that neighborhood." "I use this park daily. Stupid place to put an industrial yard." "This park is used by the community for all sorts of activities and is far away from UBC landscaping operations so it makes no sense to put it here!" 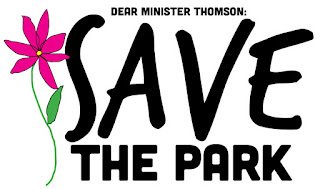 "Save our park. We use it everyday. It makes no sense to turn it into an industrial space and works yard. Trucks, traffic, noise, industrial activity would be so disruptive to our residential streets and neighbourhood." "It is illogical and unsafe to introduce heavy truck traffic into a community park which children, dog walkers, and citizens from various neighbourhoods use daily." "I want to save this park as the proposed plan to make it a work yard will be a geotechnical disaster and create a major public safety problem." "Do we really need to destroy a park to create a truck depot? What kind of crazy thinking went into that plan!" "I walk through this area everyday." "Green spaces in the city are critical to the community. Little Australia is a lovely green space that should be protected." "The plans for building a Service Yard site are completely absurd and would be a tragic loss for the surrounding community." "I am strongly against Metro Vancouver turning this pristine park into a maintenance yard." "This is a precious park and neighbourhood. Please don't destroy it by moving a works yard into it." "One of the main criteria for the selection of a suitable site was that the site chosen would have as little impact on the neighbouring community. Little Australia Park would be devastated by siting a works yard anywhere in it." "We are in our 3rd decade of enjoying our neighbourhood park while playing with our dogs and children. We intend to do everything possible to protect this green space from becoming a parking lot for trucks and a service yard. Unthinkable!" 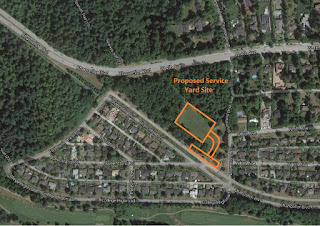 "A service yard right next to Pacific Spirit Park and in place of a wonderful park that has been used by the community for generations...at least four! Help us respect family values." "An area of tranquility close to home!" "This is not an appropriate location for a works yard. Would be better located on 16th at current PS park station." "We love this park and have used it for the past 29 years. Don't turn it into a works yard." "This is the neighbourhood I grew up in. I played in that park most days. I still take the dog there, pick blackberries there, read there. Little australia is a small community that is already being hit hard by vacant properties. Please do not destroy the neighbourhood further by taking away the park." "I have been privileged to live in the area for many years, enjoying the park with my children and dogs, and I would like to think that this will continue for families in the neighbourhood, and beyond, as this is a well used and loved green space in our area. However, my main reason for protesting this placement of a noisy, destructive works yard onto this green space is the disruption to wildlife and the environmental impact on streams in this area. Bad idea! Surely there is a better placement." "It is totally inappropriate to remove a community park in a residential neighborhood for this purpose." The park is used by many families. It's a thing of beauty." "Placing equipment and having industrial vehicles back and forth in this pristine green space is simply unthinkable for its consequences for the local community. The is one of the few safe green spaces used by children and seniors walking their dogs to meet each other. That anyone would think of polluting and destroying this community oasis is unimaginable." "I am signing this petition because I live half a block from Little Australia Park and am strongly opposed to the Metro Vancouver locating their service yard in this location. This is a neighbourhood park that we used daily when our kids were younger and it is still used by families and dog walkers as a place to recreate and enjoy nature. It is also frequented by many birds (owls, eagles, woodpeckers), mammals ( coyotes, squirrels, raccoons) and is one of the main reasons we moved into this neighbourhood 16 years ago. Please save this park for future generations!" "This park is vital to the neighbourhood and our kids ability to have a safe place to play and explore"
"Would be such a shame to lose this green space enjoyed by picnickers and children playing and adults exercising and doing yoga." "I'm dead set against taking a community green space for a works yard that has many other options to be moved to where it doesn't disrupt kids, and families"
"The park is a gathering place of calm the community needs." "Why destroy a lovely neighbourhood park with a noisy industrial project when there are other options?" "Why destroy a lovely neighbourhood park with a noisy industrial project? There are other options for the service yard." "This is the only playground for this neighborhood. This Service Yard should also not be placed so close to homes in the area." "I am signing as a reflection of ongoing destruction of our park space in the UEL in general and green space close to it. this particular location in general is well used by the neighborhood, walkers, bikers, and kids. There is poor traffic access to this site unless a street is opened up to the fourth avenue route. What in the world would make someone consider using this space as commercial/industrial is beyond me. I would love to see it developed with some park facilities to encourage more formal recreation use. I use this park regularly with my outdoor bootcamp class, and runners and cyclists train here. With extra traffic this will be dangerous. Why wouldn't the park put this storage next to other industrial space currently down by the FARM or closer to UBC?" "I live in this neighborhood." "Totally agree with this petition and object putting work site in this green space"
"I am signing because I live across the street from the proposed site and I will be directly affected. A semi industrial site does not belong in residential area." "THERE ARE BETTER PLACES TO USE AS A STORAGE FACILITY THAN THIS BEAUTIFUL GREEN PARK." "Little Australia is a well used park and meeting area for neighbours and friends in the locality. There are a host of safety, noise and other reasons why a municipal works yard should not be contemplated in this area - it should be sited well away from any residential neighbourhood. This is a really bad idea put forward by Metro Vancouver and hopefully they are by now realizing it." "I use this park regularly with my sons to throw a ball around. I love how private and secluded it is." "This is an important recreational and open space area adjoining Little Australia used by many community members in the UEL. It must not be converted into an industrial space. The BC government should extend the lease of the current works yard off Chancellor and not waste taxpayers money. Additional space has recently been created at the current works yard with the closing down of the recycling centre so space cannot be the reason for this change. Our government should be honest about why it will not extend the lease." "We lived beside this park for almost twenty years. 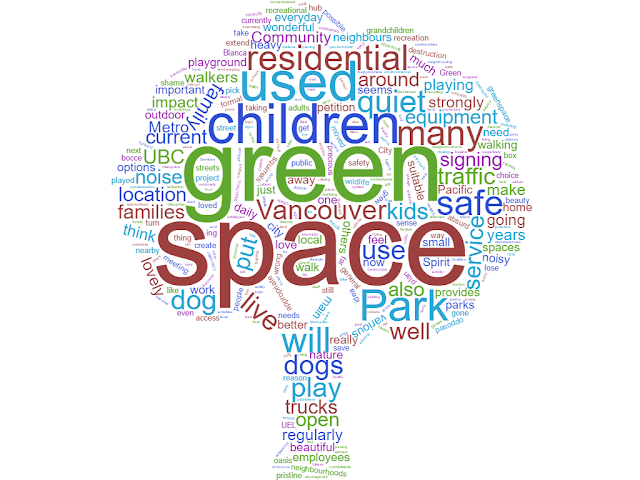 It is integral to the neighbourhood"
"I oppose a public works yard in a residential neighborhood where children and animals play"
"This is our only greenspace. Please don't destroy it!" "The Little Australia community park is important to me, my family and my neighbourhood. It's a 'green' and as such provides the heart of the community." "Little Australia's Community Park is the hub of our community. Under no circumstances should it be turned into a works yard. So glad an election is coming up!" "I am concerned about the impact of increased traffic and noise that will be created in my immediate neighbourhood. Neighbourhood picnics and casual play by my family will no longer be possible"
"It is absurd to destroy an existing community park while there are other alternatives for the works yard." "I AM A RESIDENT AND DO NOT WANT THE SERVICE YARD HERE." "a park is good for mental health"
"I really wish this park to remain as it is now - can't imagine having a Works Yard, of all things, there." "Why would you do this to such a lovely community. It belongs off of marine drive." "I grew up playing in that beautiful little park and hope others have that opportunity as well." "My husband and I vehemently opposed to this proposal. It would negatively impact our neighbourhood and our lifestyle. My husband would like to add the following: " No question, we are fortunate, some might say spoiled, to live in little Australia. One of the requisites for this is a little jewel of a nearby park currently under consideration as a work yard. This precious, open, green space remains the only nearby recreational area available to adults, children, grandchildren, dogs and various species of wildlife (particularly the feathered variety) not only from our neighbourhood but also for those living on both sides of Blanca. To destroy this gift of nature with increased traffic flow, noise, and pollution would be a tragedy. Please reconsider a decision that would have such a negative effect on a community's way of life. " "The park at Little Australia is a little oasis where you can play with your children, walk your dog or just lay in the grass. That Metro Vancouver is considering placing a works yard there is bureaucratic madness!"